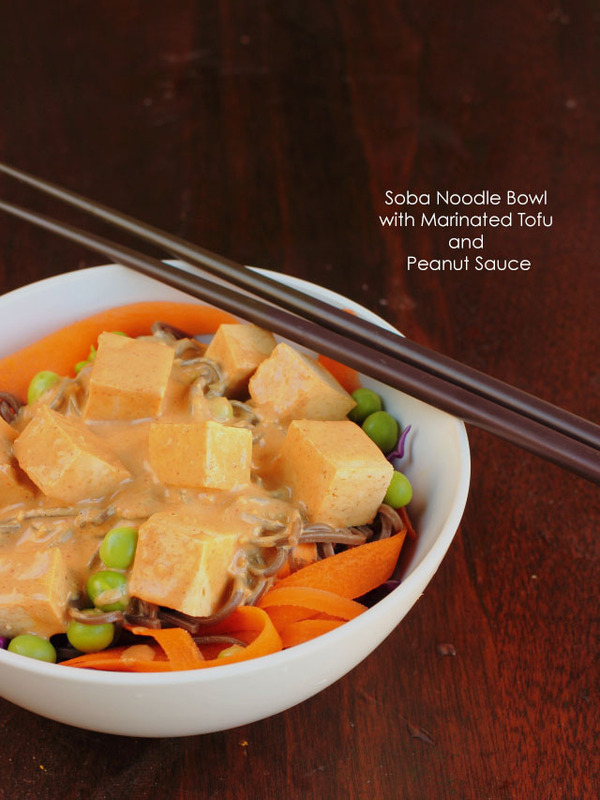 If you asked what my ideal lunch would be, I would have to say it’s this soba noodle bowl with marinated tofu and peanut sauce. 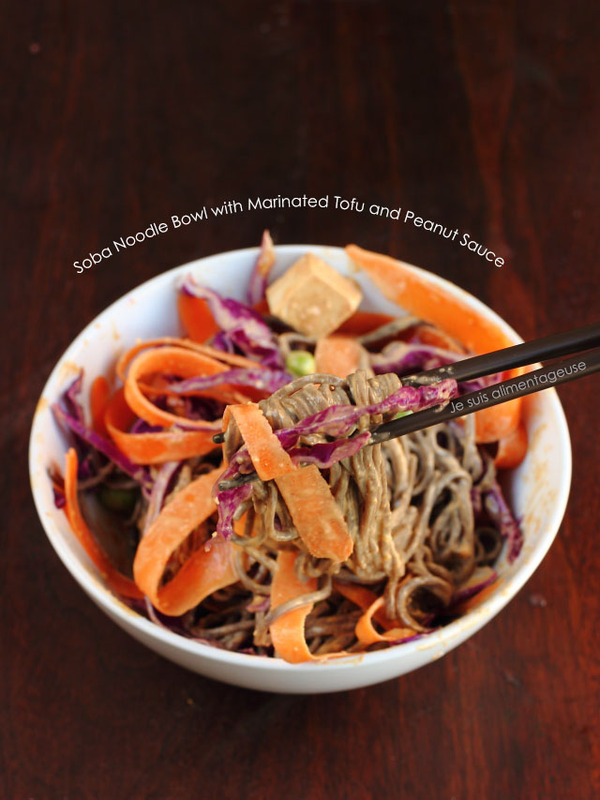 Soba noodles are made from buckwheat, which is naturally gluten-free, so all you GF friends, this one’s for you. The noodles have a deep, earthy flavour to them that’s beautifully contrasted with some crunchy carrots and cabbage, with the sweet crunch of sugar snap peas, the tang of marinated tofu smothered in this amazing peanut sauce that’s adapted from the Fresh Buddha Bowl peanut sauce recipe. Â It’s legitimately the best lunch ever. I love eating all of the different colours, especially when smothered in peanut sauce. I’ve been having for lunch every day for the past 4 days, and it’s still delicious. And naturally pretty healthy with lots of protein, nutrients and great veggies. Speaking of healthy, JSA’s been getting some link love from fitness blogs and sites, which has been awesome, but I don’t want you guys to think that I’m a health food blogger. Because… let’s be real. That’s not me. While I’m a yoga fanatic and a vegan, a #fitspo #fit4life health blogger I am not. When I crave chips, I eat chips. When I want cookies, I make a batch of cookies. But I usually just don’t give myself the opportunity (aka the ingredients) to do these things on a regular basis because otherwise I’d literally be Netflix binging all day with cookies and chips galore. I know my limits and how to listen to my body to understand what it wants. But I don’t do any dieting, calorie counting, or workouts solely to burn off all the calories I ate in a day. Because first of all, who has time for that? And second, that’s not how I approach food. JSA is not a diet blog. It hasn’t ever been one (c’mon, I post cupcakes and sweets on a regular basis) and will not ever be one. There’s a difference between a diet for weight loss and a diet that describes what I eat on a regular basis.Â I believe in a healthy, plant-based diet that’s ethical and sustainable. If I lose any weight, it’s because I’m making long-term lifestyle changes to my diet and exercise routine that will result in a strong, healthy body. But weight loss is not my goal, I just want to make that clear. I shared this article from the Huffington Post on my Facebook page, and I thought it would be important to share it again. If you have goals to lose weight by eating a plant-based diet, that’s great for you. I applaud your goals, your persistence and dedication to them, and I wish you all the best. But please don’t make my recipes and expect to lose weight because that’s not how I eat. Â JSA is a food blog that documents my food adventures. Â That’s it. That’s all. To make this for lunch, prep the noodles (you can also substitute with cooked brown rice), cabbage, carrots and peas the night before and layer in an airtight/sealable container. 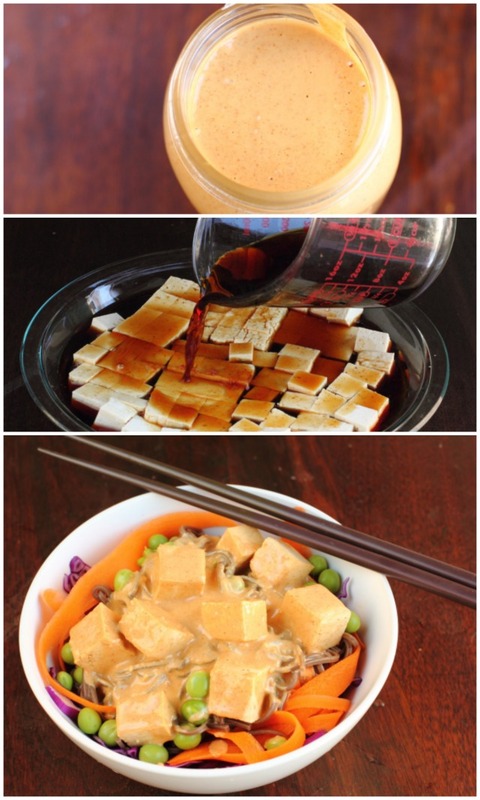 In the morning, add the drained marinated tofu, drizzle some peanut sauce on top and be on your way. When you're ready for lunch, just open up, stir, and enjoy! Wrap the tofu in kitchen towels or paper towel and press between two flat surfaces (I use cutting boards) and something heavy on top (I use my cast-iron skillet). Let drain for about 30 minutes. Cut, and lay flat in a shallow dish. In another bowl, whisk together coconut vinegar, tamari, maple syrup and water until combined. Pour over tofu and let marinate for at least an hour. You can also store it in a container and let it marinate in the fridge. You can reserve the marinade for up to a week to marinate tempeh or more tofu. Layer the noodles, shredded carrot and cabbage, peas, drained marinated tofu and drizzle 3 tbsp of peanut sauce on top. Mix and enjoy either hot or cold. Aw thanks girl =) The peanut sauce is addictive! Aw thank you Lisa! I really appreciate the time you take to read my posts, and I hope you try the recipe out! I don't eat tofu just as a protein substitute for meat, but I actually grew up eating tofu all the time because it's pretty common in Vietnamese cuisine. I hope you give it a try and like it this way =) The most important thing about preparing tofu in this recipe is to press the tofu for at least 30 minutes and drain all the moisture you can so that it can just soak up the marinade like a sponge.